Cognitive Excellence: My favorite part about the Carbon Prep by Layne Norton Stim Free Pre Workout is that even despite not having caffeine, this pre workout has an incredible impact on your mind. I’m always hugely in-touch with how these products make me feel emotionally and mentally- basically to a greater extent than the body effects themselves. I know how to control my body. With my mind. If you get your mind right, you can get your body to do whatever the hell you want. That’s why the mental mood and focus side of what Carbon Prep by Layne Norton does is so huge. So what does it feel like? For me, I just feel sharper. I feel like I can translate what I’m thinking into words or actions more efficiently. That’s truly the best way to describe it. You can concentrate better, and have greater control over the body and how it moves. It might sound far fetched, but just trust me on this. The Second best benefit of Carbon Prep stim-free pre workout is a really good total body pump. An interesting thing about the pre workout industry is that for so long it has been defined by the creatine and caffeine combination. While I have personally enjoyed this duo countless times, there have been interesting studies showing that the caffeine might actually compromise some of the effects of the caffeine. Which is sort of troubling when you consider how many gallons of caffeine/creatine combination have been coursing through our veins for so long. But since Carbon prep has no stimulants aka no caffeine, there is nothing limiting those creatine results. That means the citrulline malate and creatine can flow freely through your body and really open things up for a great pump. I’m usually not a pump maniac. Well, I guess I kind of was after trying White Rapids. But Carbon Prep stim free by Layne Norton DOES give terrific pump and at the same time improving performance. Um. 10, Allie? Yes. I’m giving Carbon Prep one of the very few perfect scores on anything. Yeah. Anything. I don’t think I’ve given a 10 since the taste on the Apollo protein powder. But this is as good of a formula as that is a delicious protein shake. This is like. Really, really good. There is a healthy dose of citrulline-malate, which has become the foundation of almost every pre workout on the market these days since it has the research behind it to boost strength and give that pump. Creatine monohydrate speaks for itself. I like how Layne didn’t try to re-invent the wheel with Carbon Prep pre workout by giving it all the latest and greatest forms of creatine (HCI is super popular now-a-days). Patented BetaPower betaine is a welcome inclusion for those of us lifting those weights. Astragalus membranaceus is an ingredient I’ve never had much exposure to, but reading up on it, I’ve been really impressed by what I’ve found. Astragalus membranaceus is a powerful immune system booster that also can extend your endurance during exercise. I think it’s a super thoughtful addition to this stim-free pre workout. 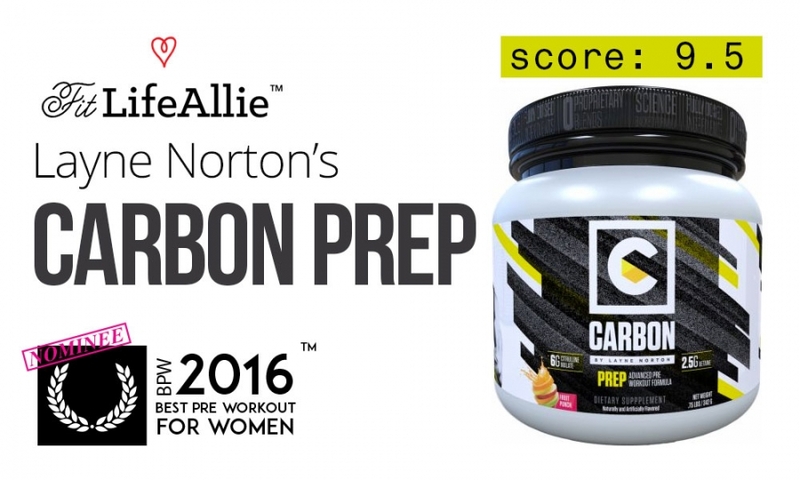 Other awesome ingredients in Carbon Prep include Carnipure L-Carnitine L-Tartarate, Theobromine, and Alpha GPC. Add in some Rhodiola Rosea and you have a very, very powerful energy booster in itself. These are the real ‘engine’ of the formula and are responsible for how crazy-focused and sharp I feel mentally when I take Carbon pre workout. On top of all these amazing ingredients, you have a pre workout that is transparently dosed. You don’t see that very often. Ok let’s talk taste. Ok so this comes as no surprise that Carbon doesn’t blow you away on taste. I mean. You can’t be perfect at everything, right? If it was up to me I would choose the product that tastes lousy but performs great every single time. As I start to review more stimulant free pre workouts I will be very interested to see if some of them end up focusing more of the research and product development on the flavor to distract you from the fact that they aren’t very effective at boosting your workout. Of course that is not the issue with Carbon Prep. As I’ve described- this is an incredibly effective pre workout performance booster that Layne Norton has created. In terms of that taste. I got the fruit punch flavor. I don’t DISLIKE it at all. Don’t mistake the 8.4 as a bad grade. Because it’s really not. I’ve just been spoiled by amazing tasting pre workouts like EVL ENGN. Which doesn’t really compare to this since it is full of stimulants. I had the fruit punch flavor of Carbon. Carbon Prep by Layne Norton is not very ‘Hawaiian Punch’ tasting, but is really more of a berry taste than tropical in my opinion. It has a nice balance of sweet, salty, and sour. But it’s not something you really want to sip on everyday. I GET the look that Layne is going for here. I really do. It’s that raw, responsible, ‘look who’s the mature big brother’ who took the caffeine away from the pre workout, look. I get it. And I get the marketing and I get that he’s going to sell a crapload of Carbon because of that. But in my opinion, this just isn’t a very aesthetic package. The yellow and black looks much too ‘contruction-workzone-y’ for me to be attracted to. The big ugly white tub is also just so noticeable that he couldn’t overcome it. You just can’t cover enough of that big old thing. In real life, the label covers even less real estate than in the pictures online. Just so ya know. But. Yeah. I don’t know. What do you think of this label? I just find it unattractive and it doesn’t speak to me. But I’m also a chick. There might be some guys that are going to get hardons for the streaky asphalt look. But know that this is not a deal-breaker for me, much like the taste isn’t. Carbon Prep is a totally solid pre, and may very well be the best stimulant free pre workout on the market right now. On that note, let’s round things up, shall we? I’m giving Carbon Prep a 9.5, or a 95/100. That’s literally the best a stimulant free pre workout will ever get from me. I promise you that. At $35 per tub, you are getting 20 reasonably priced servings. I mean. It’s a big expensive formula. So nobody is expecting a much lower price than that. The formula is great. The product flat-out works. And the price is right. I call that a winner. Go buy some Carbon Prep by Layne Norton. * You’re welcome, for the review, Layne. Call me. Wink wink. LOL.